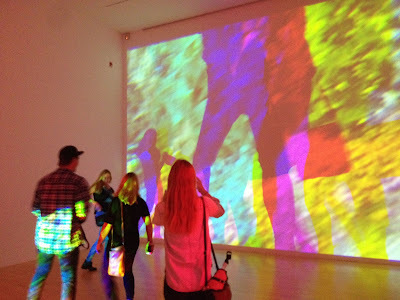 I went to LACMA the other day to check out the exhibit by Diana Thater before it closes in late February. Thater works primarily in film, using motion & light with multiple screens. The piece above was inspired by, and filmed in, Monet’s Gardens of Giverny, filled with beautiful natural colors that transform when you step between the screen and projector. It’s an irresistible invitation to place yourself within the art piece, to become part of the show, as these millennials were to me. 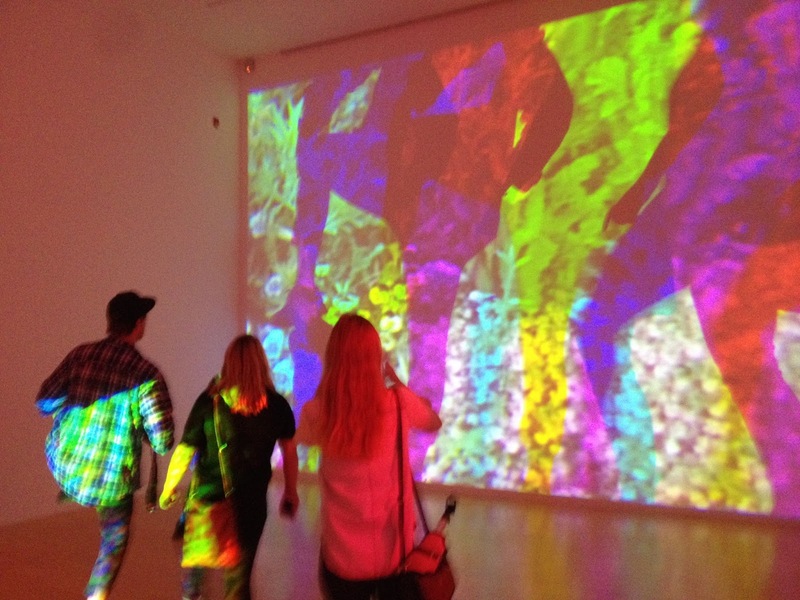 It got me thinking about art, and about museums, how much they they open us up to new ways of seeing. The first famous painting I ever saw in person was the Mona Lisa, DaVinci’s masterpiece hanging in the Louvre. I was four, maybe five years old and it meant nothing. A small dark picture of a lady. For my parents the Mona Lisa was on the must-see while in Paris list, for us kids the Louvre was little more than an escape from the cold of a wintry Parisian day. 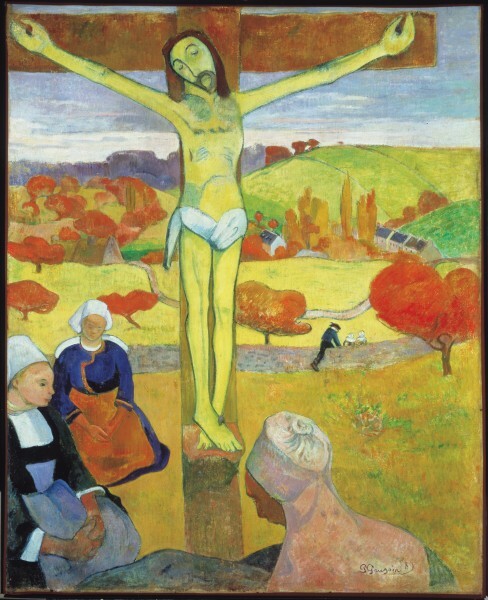 The first painting by a famous artist I saw that did mean something to me was Gauguin’s The Yellow Christ. It was a warm spring day in the late 1960’s and I was on a field trip with my 7th grade class. We’d taken a school bus—a bright yellow school bus—all the way from Niagara Falls, Canada to Buffalo, New York, and the Allbright-Knox gallery where the painting still hangs today. Freed from our classroom rotations, puberty pounding in our brains, we bounced around on the bench seats, not a safety belt in sight—something that still hasn’t changed all these years later—and cared more about what we were wearing and how cool Rod looked in those white Levi’s and who we were sitting next to on the bus than we did about the art. Let loose from the bus, bursting into the stark, bright space of the museum we could barely contain ourselves, high on being out of school, not just away from Princess Elizabeth Secondary School, but out of the country. We were in the states! How cool is that, eh?! Filing down the gallery hall in an unruly way line, we halted before Gauguin’s painting, stopped short not just by the teacher, but by the shock of the painting. There Jesus Christ on the crucifix, painted in yellow like a crude cartoon, his arms and legs like spindly sticks, his hands like claws, discordant, out of keeping with the more realistic way the women in the field were painted. I didn’t come from a religious family but my parents had sent me off to Sunday school when I was a little girl. I’d only seen Jesus the way he was pictured in the pages of my Sunday school bible and in Hollywood movies like King of Kings and The Robe. Those images of Jesus looked nothing like this. Standing there, a portrait in yellow myself in a brand new outfit bought for the occasion: a yellow ribbed poor-boy t-shirt, orange corduroy miniskirt with tiny yellow flowers and orange fishnet stockings on my skinny legs, I was thrilled by this radical view of Jesus. I was doubly shocked to learn the modern looking work was created by the famous French artist Paul Gauguin and that he painted the picture in 1889. Was it wrong—maybe even sinful—to portray the son of God this way? I barely had time to ponder the question before we were hustled on down the hallway. We were on our way to see “The Mirrored Room” a little house built completely of mirrors, inside and out. Walls, ceiling, even the floor, were all mirrors. But this wasn’t a piece of art simply to look at; like Diana Thater’s Giverny, you were meant to interact with the work, to go right inside where there was a small chair and our own reflections mirrored back zillions of times. All of us girls in our short skirts—we weren’t allowed to wear pants to school back then—horrified but giggling at the notion the boys might see our underwear. I’d thought art meant paintings like the copy of the Mona Lisa my parents had hanging in our hallway back home: beautiful, realistic replicas of people and places. Suddenly art was something that could be wild and dangerous. Art was Jesus painted a crazy color, that made you ask questions. A house of mirrors that made you laugh. Art could be anything, it was all in how you looked at it. My orange and yellow outfit, that was art too. How long ago was that? Over half a century and that Yellow Christ and the Mirrored Room stay with me still. Do you remember the first piece of art you saw in a museum? How did it define what art means to you? 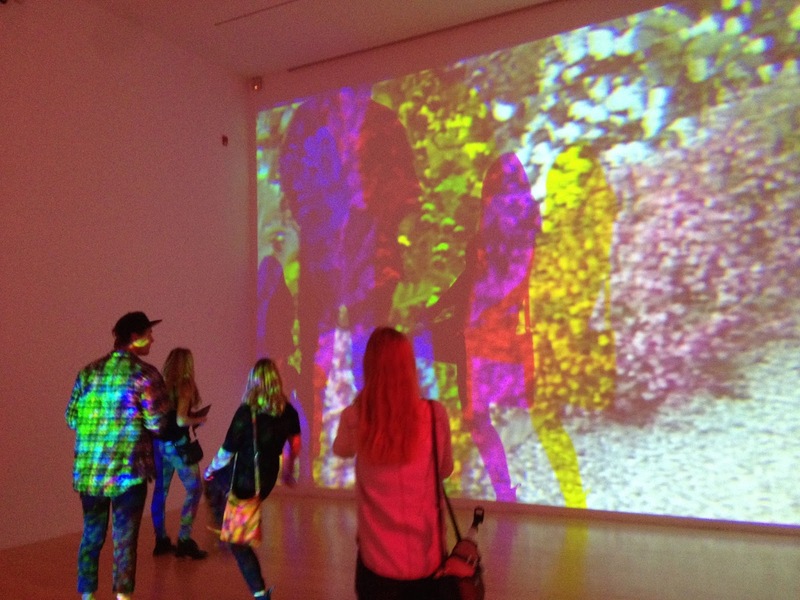 The #DianaThater exhibit +Los Angeles County Museum of Art closes February 21, 2016. Sim, Another terrific story. I'd love to see more of that exhibit based on Monet's Garden. I hope you get a chance to visit there when you go to France next. And your yellow Christ is shocking. How great that it stayed with you. I don't remember my first painting, but I do remember visiting a Shaker museum with our class, and there were tiny Shaker items to buy in the gift shop, like tiny jugs and bottles. I alone knew Scarlett had run away to Paris and the responsibility lay on my shoulders, like the famous painting of Jesus with a lost lamb draped around his neck. Then there in front of me in the halls of the Louvre, as if conjured by my musings I saw a painting of Jesus dressed in a scarlet robe and surrounded by a crowd of people. But he didn’t carry the lost lamb home to safety in this painting. Instead, the weight of the cross rested on his shoulders, on his way to death rather than redemption. A sob strangled me as I glanced at the card mounted next to the painting. Christ Carrying the Cross by Florentine artist Biago d’Antonio. I shook my head and scurried away from the painting. No! The weight on my shoulders would be the lamb, not the cross. I would find Scarlett and bring her home. Thanks for sharing those lines from your upcoming novel! I’m excited to read it, I love your all your books set in France. Do you have a publication date yet and will you still be here or in France? Wouldn’t it be funny if you moved to France and started writing books set in the states? That would be ironic. I do have one book out that is set in the States and a couple others on my computer that I'm still working on. No publication date yet. I'll go the traditional route first and see if I can make the Barnes & Noble bookshelves.